Bagging another international victory for Sri Lanka, renowned model Aruni Rajapaksha beamed with delight as she shared the news of her new found victory with her fellow companions and well wishers. Winning the second runner up title at the Bride of the World international beauty pageant is a feather in her cap indeed for it brought fame not only to the stunning lady but also to her motherland. Her radiance, presentational skills, intelligence and most significantly her Asian mannerism contributed to her victory. 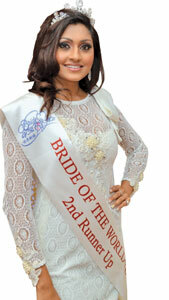 The Bride of the World competition was held in Macau, China, in October. Compared with past and reigning beauty pageants, Bride of the World takes on a totally different format. Still two years young, its main focus is not on beauty and visage but more on family values, marriage, motherhood, career and feminine behaviour. It is an exemplary pageant which emphasizes the value of womanhood rather than the outer appearance. “It was a totally different experience for me. We had to do presentations which signify women’s values and their role in our country. Being Sri Lankan, I am proud that we have a lot of values in connection with a woman’s role. I scored a lot of marks by presenting our social and cultural values to the jury. My national costume, too, drew a lot of interest as it is beautiful and unique. I worked hard and was totally dedicated to the pageant. My entire focus was on bringing victory to my country. It was fruitful as I was rewarded with success,” an elated Aruni informed the Daily News. 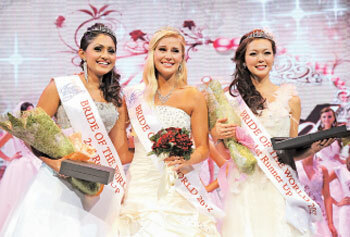 Christina Mikkelsen from Denmark was the winner of Bride of the World 2012. The first runner up was Fong In Inez Leong of Hong Kong. Around 34 countries took part in the event. The girls had to present themselves in different costumes for a number of sessions. However the competition did not require them to don bikinis. They were interviewed many times so that each got the opportunity to establish their personalities and the country’s image in the judges’ minds and among the audience. The finale saw the contestants on bridal gowns. This, she stressed, was the most eye catching moment of the event. Imagine 34 beauties dazzling the stage in a range of breath-taking, soft coloured fabrics! The Bride of the World concept derived as a means of promoting Asian Family values in the west. While most of the beauty pageants are based on the western culture, Bride of the World is more into nurturing the feminine role model. It was incepted by a Singaporean named Cheng Keng Teo who believed that the Asian world needs to promote its values among the rest of the globe. According to the Bride of the World team, the word ‘Bride’ stands for benevolence/bravery, respect/resilience, intelligence/integrity, devotion/dedication and endurance/enterprising. 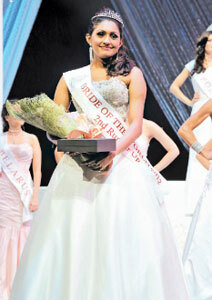 This is not the first time that Aruni has taken part in an international beauty pageant. She was Miss Sri Lanka for the Miss Universe competition in 2008. She has also competed in the Ms Tourism Queen International and Ms International competitions. A successful model who had seen her picture adorning many cover pages in magazines and newspapers, Aruni recently debuted into acting Udara Palliyaguruge’s film , Super Six . She has also appeared in an item song in a Kannada movie.